Rated 5 out of 5 by LadyHawkMT from Great game! I was a beta tester with this game and I couldn't wait for it to be released. The story plot thickened, that was great, the challenging mini games were great, the scenery was beautiful and inviting, the HOS's were average but still challenging. Over all it was all I had expected and hoped for. Rated 5 out of 5 by gyanda from Beautiful!!! This was a very entertaining game for me - and it is long, which is such a pleasure, when you fall in love with the dragons and the gorgeous graphics. I did like everything about it, for all its playing-smoothness, which would be a category i would add to the questions put here when you give a review. Smoothness means it is so well constructed that you always know what to do next and it is like a dance more than "work". I just loved this game. Rated 5 out of 5 by nickr63 from a joy to play This has got to be in my top ten games. The game play was just right in challenge, speed of play, music, and the visuals are lovely. I aways think its such a shame that the scenes are so well drawn but you get to explore them a bit more. The story line was good as well with the bonus explaining the past a bit more. I like the way it lets you know how many objects there were to find in each scene so you didnt spend ages checking there wasnt anything you missed. I would like to have more items to find in these games and so extend the gameplay more. Rated 5 out of 5 by LyolikKG from Really nice one! Liked the visual style and the overall atmosphere. 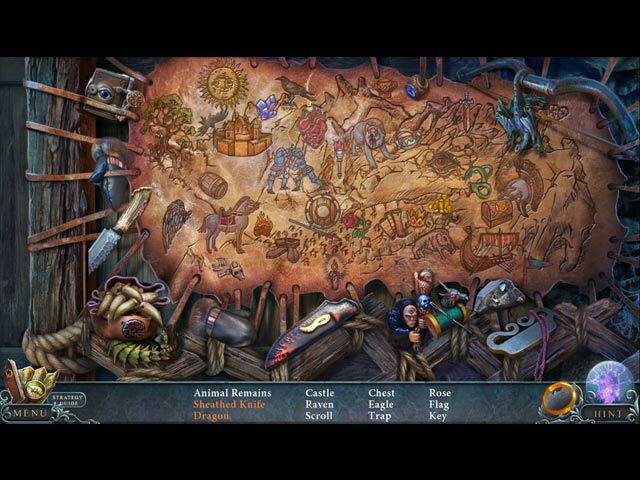 Story is interesting and the game play is not of a typical hidden object game. 5 stars! Rated 5 out of 5 by judeejuju from Loved it! Really enjoyed the game. Storyline gripped me as love this genre. Varied HOs and not too many and some good puzzles. Rated 5 out of 5 by skullfun from Ring of Destiny sets a new standard for Fantasy Adventure Lovers! I love the Living Legends series and Immortal Love, and now these developers take the genre to a whole different level. 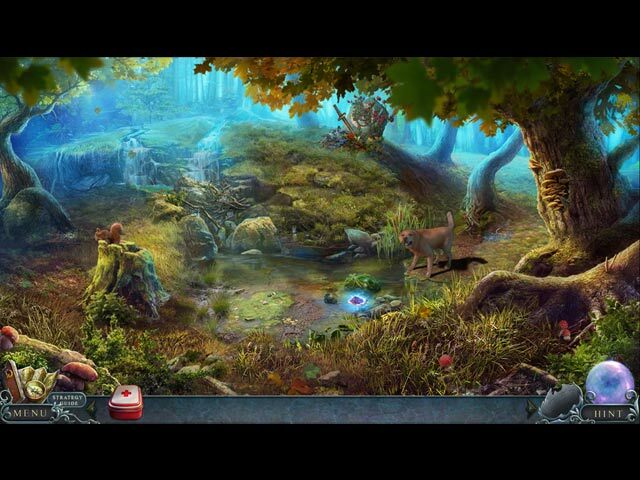 Edge of Reality: Ring of Destiny is a hidden object adventure game in which you play the role of an ordinary woman who gets herself into an extraordinary situation. The gameplay mechanics are pretty much the same as in every other game in the genre, but the adventure is engaging enough to keep you distracted from this fact. 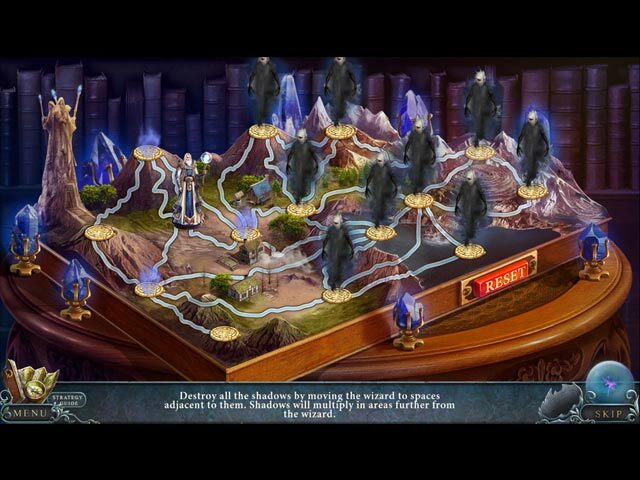 Not only that, but some of the puzzles can put you to the test if you are not familiar with the usual tricks. As for the story, it all starts when the main character decides to adopt a dog and is about to take it home in her car. However, the dog (whose name is Ice) starts acting all anxious when they reach a nearby swamp, which is when she decides to let it lead her to the place in question. As it turns out, she finds a powerful ring in the water and she is transported to a different dimension once she puts it on. I was totally captivated with the story by this point which is early in the adventure. Most fantasy stories contain some kind of powerful item that can decide the fate of the entire world, given the fact that the faction with control over it is guaranteed to win the war. There’s always some kind of adventure surrounding the artifact in question, which happens to be the case with the game at hand as well, although it’s a bit more complicated than that. As always, most of your time is spent trying to figure out what items can be picked up and how can you combine them in order to unlock the way to the next area. It actually gets pretty intense after a while, and the objects you have to find are never the same. I thought the puzzles were pretty exciting, although most of them are just asking you to unlock some kind of mechanism or find a specific pattern. Things are quite decent in the graphics department, and there are even some 3D objects part of certain scenes, such as the dog in the beginning. The level design is very engaging as well, and you can tell that a lot of work went into every scene to make them as detailed as possible. There’s even exceptional voice acting and a nice soundtrack to keep you company along the way. It's a fantastic trip to a different dimension worthy of Editor's Choice Award. Ring of Destiny may not impress players with it's puzzle quality or exciting new gameplay mechanics, but the journey and the story is definitely worth the bother, especially if you are a fan of the genre. In addition, the game world looks gorgeous, and it’s a pleasure to explore it... ? ? Rated 5 out of 5 by expotanne from An opinion rather than a proper review Put simply, I loved this game! I admit to being a hardened Whispered Secrets fan and this is a game of the same quality. The puzzles were (as far as I'm concerned# quite varied, the graphics were top quality and I didn't even mind the fact that the mouths didn't move! It has everything I love - dragons, wizards, morphing bits #I missed two Dragonlings and was very upset I couldn't go back and find them!) The bonus game is quite a decent length too. All in all, if this is the way that the series is going to go - then I'm at the front of the queue. Rated 5 out of 5 by margann1952 from GIVE ME MY DOG BACK! I just finished playing the demonstration and enjoyed it a lot. However, the evil queen took Ice, my dog and I want him back. I guess I have to buy the game so that I can rescue him. The graphics are excellent as are the audio and special effects. I am a big fan of dragons and all things fantasy. Games such as these mystical mythological games help us to escape for awhile, the everyday things we go through. I wait with anticipation for the next new games to come out and this game I am definitely going to purchase. It has everything I want in a game. Fantasy, Magical Creatures, Dragons, good storyline and just true blue escapism. I really enjoy the games more when there is interaction between the characters and when a helper is included in the stories. That is why I have to finish this game, to rescue Ice. As always the heroine receives help along the way from a myriad of interesting characters. The mini-games and HOS are interesting and varied. I found the storyline keeps you interested in as much as you want to see what the heroine receives in obtaining magical powers along the way. So far she has two. I can't wait to see what her next power will be. Hopefully there will be another episode to follow this one, the first in what I hope will become a series, especially if Ice is included as helper. 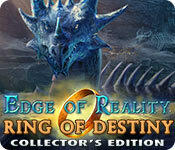 Rated 5 out of 5 by mauverose from Sharon Ring of Destiny is a very fun game to play. It is very easy to find your way around. The hint charges real fast. The graphics and music are wonderful. Love the story. Plan on buying this one for sure.